>I’ve notice recently that I was unable to add a link to my blog while leaving a comment on Blogger. If you comment on a Blogger blog with your Blogger identity it links to your Blogger profile which has a list of your blogs. I often like to leave a direct link to one of my blogs on Blogger blogs that allow anonymous comments that’s why I usually allow anonymous comments on my own blogs. 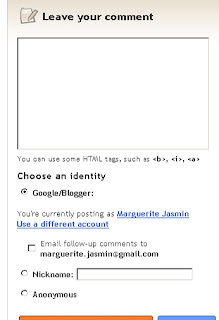 Now Blogger gives you three commenting identity options: Google/Blogger ID, Nickname and Anonymous neither one of those allow you to leave a direct active link to your site. I’m guessing the Blogger team did this as part of their continuous effort to fight comment spam but was it a smart move? What do you think? This entry was posted in Blogger comments by admin. Bookmark the permalink. >i didnt hear about that. i do hate blog spam. i hate spam in general. i’d give up quite a lot to get rid of spam. nice blog, and thanks for the comment on bloggertalk. Blogger has brought the link back. I guess too many users were not happy about it and which left Blogger with not other choice. It seems your experiement is over now how about publishing the results?